In 2006 Microsoft made a bunch of "hoopla" over something called "Oragami". Oragami turned out to be just marketing hype for a new batch of small tablet PC's. This initial batch of Ultra-Mobile PC's, or UMPC's were overpriced and underpowered. 2 years later the UMPC market is exploding, and Microsoft has little to do with it. In 2008 we are seeing what many refer to as a "Race to the Bottom". Manufactures can't build small, low cost laptops fast enough to meet demand, and the number and variety are expanding so fast that even us in the industry can't keep up with the product announcements. It is unquestionable that the ASUS Eee PC is the star at the center of the UPMC supernova. But it's a standard laptop form factor, not a slate, and, while Windows XP versions are available, it is Linux that is getting all the attention. The $1500 and up Tablet UMPC's are just not selling. Time for our case-in-point -- UMPC maker Wibrain. 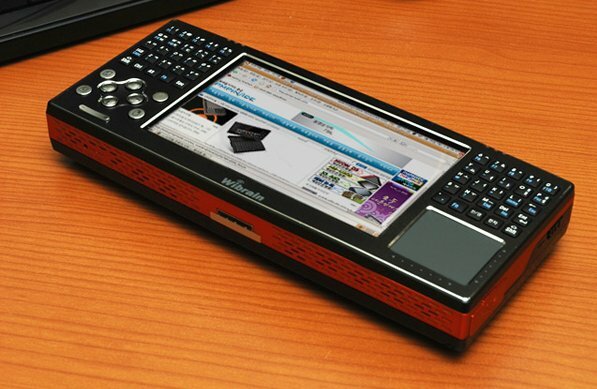 Wibrain was one of the first on the scene, and introduced one of the tiniest UMPC's available. Reviews were good, but the original Wibrain suffered in terms of price and performance. Seeing the direction the market was taking, Wibrain had to quickly introduce a machine that was more responsive and hundreds of dollars cheaper. How could they do this? -- Linux to the rescue. By moving to Open Source, Wibrain was able to drop the price significantly, while simultaneously offering more included software and improved performance. That brought them in a position to directly compete with the Eee PC, and other inexpensive UMPC's like the Pepper Pad 3 (Reviewed here on Linuxslate.com). It is important to note that Wibrain's approach, as we will see, is different from that of ASUS and Pepper's. The Linux that the Wibrain B1L series runs is a nearly un-altered version of Ubuntu 7.10. Conversely, Pepper, and to a lesser extent, ASUS, have gone to great lengths to come up with a optimized, user friendly environment built on top of Linux. The fact that Wibrain was able to do drop a largely unmodified Ubuntu distribution onto therr existing hardware is a testament to both the B1 series hardware, and to Ubuntu Linux. Additional items not shown in picture are in bold. Power brick, with round prong AC Plug. 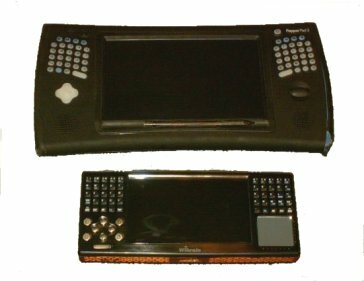 Wibrain vs. Pepper Pad 3. I won't spend much time on the hardware since it is the same as the Windows versions, and those have been reviewed elsewhere. Clearly, I like the split keyboard tablet form factor. In my review of the Pepper Pad, I mentioned that having 2 space buttons was nice, and worked well for gaming. Unfortunately the Wibrain lacks this, and has a space key only on the left, and it is no larger than any of the other keys. This minor complaint is far out-weighed by the other features of the Wibrain's controls. The Left Click, Right Click Keys, Page Up and Page Down are very handy, and the track pad serves as an analog input for gaming. A couple more notes in comparison with my Review of the Pepper Pad: First, the Wibrain lacks the Pepper Pad's scroll wheel, but makes up for it by using scroll areas on the track pad. Scrolling is fast and smooth. Horizontal scrolling is off by default, can be enabled in the OS's Mouse Applet. Due to the track pad, the touchscreen almost becomes redundant. Secondly, I mentioned the nice even lighting on the Pepper Pad keyboard. The Pepper Pad wins on this front as keys near the edge of the Wibrain are noticeably dimmer. My compliant about the rather low-tech power brick included with the Pepper Pad 3 also applies to the Wibrain. Not only is the complaint the same, but the power supply specs, connector and polarity are the same. If anything, the Wibrain unit is worse. It's rounded shape makes it harder to wrap the wires around, and the output wire is very poor quality. I am quite sure most road warriors will destroy it in a short time. The feel of the keys is good and there are no case creeks. The screen is as clear and sharp as any device out there. At 1024x600 (the same resolution as an Eee PC 900) over a 4.8 inch screen, what is shown is small, but 100% sharp. A big omission is the lack of a built-in stand. Wibrain intends that the stylus or the pick stylus be inserted into a small hole in the back of the unit and be used to prop the unit up. This works, but some sort of fold out stand would be far better. The small and easily pocketable device also lacks a standard PC security slot. The Linux units sport a cool metallic orange trim that makes them stand out in a crowded UMPC world. Out of the box, Ubuntu 7.10 (Gutsy Gibbon) manages the hardware pretty well. On-going work continues at a Special Google Code site [Link Below]. There is also a Google Groups forum (Same Link), but both of these are primarily in Korean. See the forums for information on upgrading to Ubuntu 8.04. Update: This section has been updated to reflect a Wibrain running Ubuntu 8.04 (Hardy). Some sleep/hibernate features do not work properly on units running older versions. Modern laptop hardware supports 2 different standby modes. 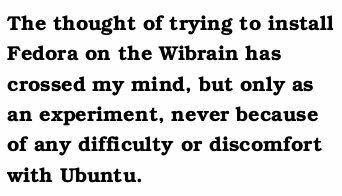 As of Ubuntu 8.04, the Wibrain supports both. In Sleep, also known as Suspend to RAM or simply Suspend, the RAM and parts of the CPU remain powered. Resuming from Suspend takes only about 6 - 8 seconds on the Wibrain. In my haste to correct this article, I have not waited to see how long the B1L's battery lasts in sleep. I can tell you that in general, such devices can remain in this mode for a day or two before the batteries are drained. Hibernate (Suspend to Disk) is also supported. Since the unit is fully off during Hibernation, the battery can be removed without needing a reboot. It takes 45 seconds to resume form Hibernation. With Suspend working, the entire Wibrain concept is far more useful and valuable. Never the less, Hibernation and Suspend still have some issues on the Wibrain. Apparently, Suspend must be initiated from the Ubuntu Log Off menu. If you set it to suspend directly from pressing the power button, it will not resume properly. Forgetting to turn off wireless before Suspend or Hibernate can also result in problems. Even when remembering these things, an attempted Sleep or Hibernate occasionally results in a crash - Save your work boys and girls! It is imperative to assure that the unit successfully Hibernates before inserting it into the included carry pouch. That nice padded case is also an excellent thermal insulator, and should the unit be paced inside it while on, the temperature will climb to levels that could harm the batteries, the Wibrain, or worse. Use the key lock for added protection against the unit waking up while in a case. Think I'm done complaining about Sleep/Hibernate? Nope. There seems to be no way to make the display sleep even though DPMS is loaded in Xorg.conf. Want a low power, screen off mode for playing music? Sorry*. *Update: sudo vbetool dpms off - will put the display to sleep. Momentarily switching to another Pseudo terminal <Fn><Alt><Ctrl><F1> and back <Fn><Alt><Ctrl><F7> Will wake it. Remember, only the display is asleep, so use the key lock. Processor scaling (reducing the clock speed when the CPU is not busy) is not supported out of the box. There is apparently a fix for this at the Google Code site [Link], but it involves compiling and installing a new kernel. Update: According to the Developers over at the Wibrain Google Groups forum, even without processor scaling, the VIA mobile hardware is pretty good about managing power use. They report only about 5% - 7% change in power consumption because of processor scalling. My own experiments using the graphing features of the Gnome Battery Applet support this. Additionally, they report some problems with things like video playback when using the VIA supplied kernel patches. For right now the Wibrain works better with the Ubuntu supplied Linux kernel. Note that since Wibrain supplies closed source, binary drivers for the WiFi and the Video drivers, building a custom kernel, and having everything work is not currently possible. You must stick with the supported kernel version(s). The Gnome Power Manager is the B1L series' front end to Linux's battery management drivers. Together they do a great job of keeping the user informed of battery state for both charging and discharging. The Battery applet reports about 2 hours, 40 minutes on a full charge. This seems pretty accurate, and seems to remain as accurate as any portable device I have ever seen. Out of the box, general responsiveness and 2D gaming was fine. I then installed the driver from the Google Code sight [Link]. Installing the driver was easy, but the package install scripts rather rudely restarted X at the end of the install. After the update, about all I can say is Wow! - Over a thousand frames per second on the default size of GLXgears. All of the included OpenGL screen savers look great. The B1L may be one of the best handheld Linux gaming platforms around. Some 3D games may have difficulty finding a working screen resolution and bit depth. Update: With the VIA video drivers installed, it seems that the default VGA output is 1024x768, but the Wibrain's 1024x600 screen is letterboxed within that. In other words, It's 1024x768, but with unused black areas at the top and bottom. Depending on the monitor, a limited selection of other resolutions was available. While the choices of available resolutions was limited, at least some setting that maintained the correct aspect ratio on all monitors or projectors I have tried was available. The Wibrain B1L does have a VGA output, but you have to take VGA very literally. When hooked to a generic 1280x1024 LCD Monitor, I could not get anything other than 640x480 on the external monitor. I was not able to get a different viewspace on the other monitor, nor was I able to deselect the internal screen. I did not try totally shutting off the internal display in the BIOS. Doing so may allow other resolutions on the external monitor. ALSA (The Advanced Linux Sound Architecture) runs the audio system. The front panel volume keys control whichever ALSA slider you choose. There are some problems with audio input. First, The so-called "Communicator of the Future" has no internal microphone. I guess in the future they think we should only listen, not talk back. My wife likes that idea. Second, even when used with a standard PC external mic, the input audio is noticeably scratchy. The stereo speakers in the bottom of the unit are tinny as you might expect in such a small device. If you set the unit upright on a table it attenuates the already weak audio, and if you lay the unit on its back, you'll soon have an overheated Wibrain. Pack a set of amplified speakers if you want to use the B1L as your entertainment center while traveling. Sound in a regular set of stereo earphones is good to excellent. A standard PC headset is needed for VoIP or Video calls. WiFi range is pretty good, but it can take the Wibrain longer than some other devices to assimilate to a network. WEP, WPA, and LEAP, as well as Ad-hoc is supported. The WiFi adapter is on an internal USB connection. The WiFi adapter/driver does not support setting TX power so using WiFi adds significantly to the heat generated by the B1L. Like WiFi, the webcam is an internal USB device. It cannot be disconnected, and may be using some power all the time. It is implemented as a V4L2 (Video 4 Linux) device, but since it sends data as mjpeg (Motion JPEG), most apps cannot use it. It works fine in Ekiga, but not in SANE, Totem, or any other included app. This means there is no way to take a snap shot or record video. You can grab the Ekiga video window to get a tiny snap shot, but that's it. An optiona application called Motion (See Links) allows movie capture, snapshots, and cool features such as capturing video only when there is movement. With this app, you can even use your Wibrain as a smart remote IP Webcam. Using Gnome's Universal Access app to enable sticky keys helps a lot. Unfortunately, when doing a Caps Lock this way, the Caps Lock LED does not work. Also, since the calculator style Fn key is implemented at a lower level, it cannot be made sticky this way. Getting the desired punctuation symbol sometimes requires a moment of thought. Other than that, typing on the Wibrain is as you would expect from a split thumb keyboard. There really is not a faster way to get data into such a small device. The Wibrains have one standard USB port and Ubuntu handled a variety of USB devices I tried extremely well. 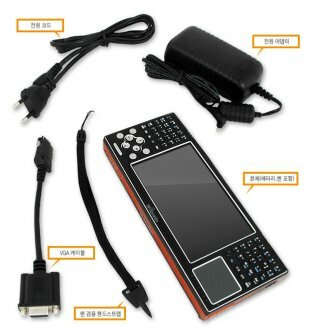 Here's a list of some of the devices I've tried. All of them worked with the caveats noted. Sony/Logitech USB Headset for Playstation 2 Works. Audio in sounds better than the internal analog audio. Buslink USB slim DVD R/W Drive Works. See below. The Bluetooth adapters were recognized immediately, but OBEX (object exchange) is not included by default, so my initial attempts at file transfers failed. See below for how to fix this. Lastly, the USB DVD drive would lock up the Wibrain when connected if the Wibrain was on. Connecting the drive when the B1LE was hibernating, and then waking it worked. I believe this is simply because the DVD Drive uses too much power. Using the drive's external power supply, or a powered hub should eliminate the problem. When using the USB headset, I did not get the static on the audio input like I did with the analog connection. Under Ubuntu 7.10, using my the USB headset seemed to occasionally cause the unit to totally lock up. This has not happened under Ubuntu 8.04 despite using it for VoIP phone conversations that lasted over an hour. This is a review of the Wibrain Linux Edition, not Ubuntu Linux Never the less, I want to highlight a few included apps and how they play along with the whole idea of the UMPC. First, a bit about Ubuntu: I am a Red Hat/Fedora Linux guy. I have used Debian and Debian based distro's before, so I can type "apt" as easily as I can type "yum". Both Fedora and Ubuntu are based on recent Gnome versions, so the difference to the user is very small. The thought of trying to install Fedora on the Wibrain has crossed my mind, but only as an experiment, never because of any difficulty or discomfort with Ubuntu. A preference for one or the other should not steer anyone toward or away from the Linux Wibrains. As mentioned this article has been updated to reflect a Wibrain running Ubuntu 8.04 LTS (Hardy Heron). Updating is fairly easy, and does not require touching the Unix command line if done the way I describe on the Forums. It is likely that Wibrains are still being shipped with Ubuntu 7.10 on them. You will want to upgrade immediately. One of the biggest selling points of the Wibrain is its 1024 pixel wide display. Web pages display full width. No scrolling or zooming is needed. Additionally, since the Wibrain is a full PC, Firefox extensions work 100% normally. Adding plugins, like Flash, Ad blockers, etc. all work just like you are used to. Page rendering is fast, and complete. True - no compromises hand held web surfing. You'll need really good eyes or a pair of reading glasses for those websites that insist on tiny fonts, but it's all there. Just like Firefox, we have true, full Open Office.org 2.3, and it is updated just like on your desktop. This is where we really see the value of having Open Source Software on a device like this. Dynamism gets US$649 for the Windows Wibrain with the same specs, but that does not include Microsoft Office. MS Office 2007 Small Business Edition is the cheapest version that gives you the equivalent of what is included on the pre-installed Linux/OOo version. Dynamism will get and additional US$449 for that. That exactly doubles the price. Why not install OOo on the Windows version? How about just buying the Linux version, and then installing Win XP and OOo? Sure you can do that, but remember Microsoft's argument that Linux is free only if your time is worthless? Back at ya. Evolution can be problematic, especially if you are trying to connect to an exchange server. Setting up Evolution is complicated by unnecessarily large windows for the setup assistants that extend beyond the Wibrain's 600 pixel screen height. The problem happens in other apps too, and I've seen it reported on Windows UMPC's many times. In Linux, just remember that the ALT key is your friend As an alternative mail client, try Thunderbird. Unfortunately software patents, and stupid laws have crippled Totem as included with Gutsy Gibbon. Fortunately, installing the missing functionality is pretty easy. See the section on additional software. Once the required extensions are added, and where legal to do so, Playback performance is excellent. Ubuntu includes a Totem Firefox plug in, so embedded videos on web pages generally play fine. I was not able to get MP3 playback working. See below for a solution. The Communicator of the future must have some app for communications right? "Out of the box" Ekiga serves this purpose on the B1L's, and it does it almost unbelievably well. Using my VoIP Service Provider , I was able to place a call to a real phone number within minutes. The only things that I encountered were the need to use an external microphone, and the fact that Callcentric does not support video calls. It took me a few minutes to figure that I must turn off "Enable Video" when using my VoIP provider, and turn it back on for Ekiga's own service. My dumb - no problem. If you already have a VoIP of conferencing account, it is literally out of the box to placing real phone calls in minutes. I challenge anyone to do that on the Windows XP version. If you are a professional photographer, or a serious amateur, this device has a whole new meaning for you. Imagine having the full, real, GIMP in your camera bag. Connect up your camera, do your editing, and send it on for publishing -- all from the local coffee shop - even if you can't get a seat at the table. Oh - Remember that price comparison with the Windows XP version and Open Office.org? Don't forget to add in another US$649.00 for Photoshop. Or you could buy your 3rd Wibrain B1LE and a few accessories. I want to make sure I am understood. Wibrain has (or actually is) making an excellent effort to bring Ubuntu to the Wibrain. However, they have really only added one userland GUI app. It is mysteriously called MFmgr, and is a simple control panel that allows you to control a few aspects of the B1LE/H. There are 3 settings for the fan: Quiet, Normal, and Cool. In each case, the fan will run as needed based on temperature, but it seems that the selection "biases" the fan speed. Even in Normal, the fan noise is not bothersome. When running on AC, I suggest always selecting Cool. The only way to destroy a Lithium-Ion battery faster than charging it when it is hot involves an axe, and is very dangerous, so I do anything I can to keep the temperature down while charging. Next is a Calibrate button that launches a pen (touchscreen) alignment screen almost identical to the one on the Pepper Pad. The right half of the app contains a setting for the internal keyboard backlight. It has On, Auto, and Off. In auto, the keypad will light for a few seconds when any key is pressed. 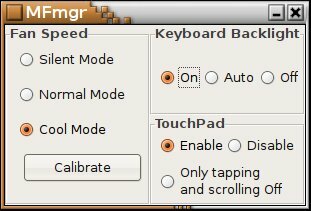 The 4th and final section allows you to disable the touch pad all together, or to just disable the clicking and scroll feature of the pad. Update: XMMS is no longer available from the Ubuntu repositories. You can get a .deb package here. The alternative is to just deal with the included Rhythmbox audio player. It is large, not as cool looking as xmms, and lacks an Equalizer, but works adequately. The new XMMS2, and one of many front ends is another alternative. It is included in the repsoitories, but I have not yet tried it. Seems to me, they have way over complicated audio playback. Where legal to do so, we can easily install some missing plug-ins to allow more formats to be supported. Note that Ubuntu's rights to distribute certain codecs, and your rights to use them may be different. Make sure your system is up to date, and that you have installed the VIA VX700 drivers from the Wibrain Google code site [Link]. Some may report that they are already installed. That's OK.
to play chapter 2 of the DVD. Select the Video tab, and for Plugin, select X Window System (X11/XShm/Xv) and select Xv_SVOV for Device. Totem/gstreamer does not support DVD menus. If this is important, you can switch to using xine as Totem's underlying engine. I did not due this since I feel that gstreamer may have better support for web video formats. The first will load 2 packages, and the second will ad 3. Yes, I know I could have done them on the same command line. This will add both remote browsing (if the remote device supports it), and it will allow you to send a file by right right clicking and selecting "Send to...". The OBEX server can now be started by selecting Accessories >> Bluetooth File Sharing. They call it the communicator of the future, but the only built-in communications technology it has is WiFi (802.11 b/g). No fear - Ubuntu and the Wibrain can support several other methods of getting online. Note: Due to the fact that these methods vary based on the particular device and version of Ubuntu on the Wibrain, and the fact that detailed instructions are beyond the scope of a review, the information that was here has been moved to the forums. Wired Ethernet via USB Adapter Tested with a 3Com 3C460B 10/100 Adapter. Worked Immediately. Worked through the Network Manager GUI, but some minor editing of system files was needed. Bluetooth Connection to a Mobile Phone Works. Had to be done from the command line when using Ubuntu 7.10. See forums. WiFi Proxy using an Apple iPhone Did work, but takes some tricks. See forums. Bluetooth PAN Not tested. Should work. USB Analog Modem or Serial Analog Modem connected to a USB adapter. Not tested. Should work with supported USB devices. In summary, Linux and the Wibrain hardware work well together, Upgrading to Ubuntu 8.04, and installing the Wibrain specific drivers fixes most, but not all, of my original complaints. Work on drivers, and of course improvements in Ubuntu Linux itself, continue; and on occassion, the Wibrain will remind you that there is still work to be done. 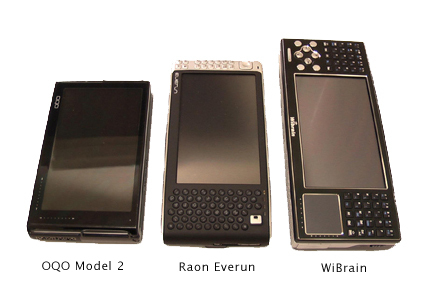 Compared to other handheld devices, the Wibrain Linux Edition gives excellent capability for the cost. It is far more capable than the Nokia n810, and the extra cost of the Wibrain is well worth it. I frankly doubt that you will find any combination of size, capability, included apps, and price that will come near what the Wibrain Linux devices give you. If, on the other hand, the form factor and size is not important for you, I think that you will have a better experience with one of the newer Linux based Eee PC's. This article was composed almost entirely on the Wibrain B1LE.